In 2007, Slovenia produced and imported over 61 million tonnes of various materials. Almost half of these materials are construction materials produced in Slovenia. Between 1992 and 2007, their quantity doubled and contributed significantly to the increase in material consumption per capita, which increased from 16.6 tonnes in 1992 to 30.3 tonnes in 2007. A substantial increase was also perceived in the total weight of imported goods, which represent almost one third of all materials used per year. Direct material input (DMI) and domestic material consumption (DMC) are indicators arising from the analysis of physical exchange or material flows between nature and society. Direct material input represents the total weight of all solid, liquid and gaseous materials (with the exception of water and air which are not directly contained in material) entering production and consumption processes in a certain country within a certain period (one year). Direct material flows are divided according to geographical origin into two categories: materials obtained from nature at home and imported materials. Material inputs of domestic origin are further divided into three main groups: fossil fuels, minerals and biomass (from agriculture and forestry). 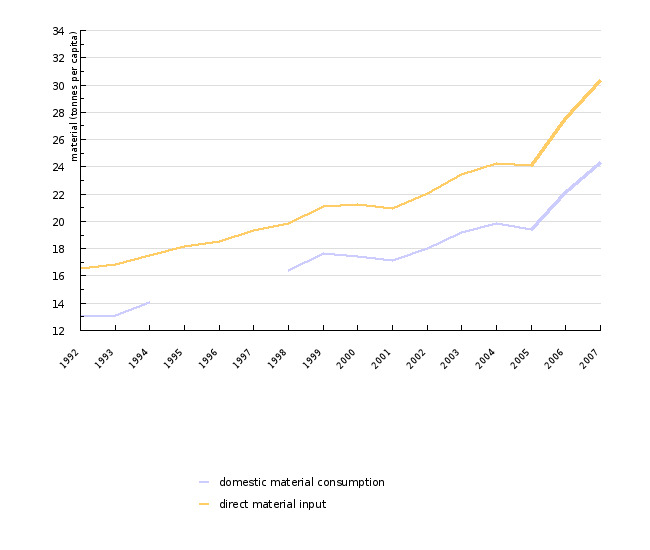 Domestic material consumption is the difference between Direct material input and export, expressed in mass (DMC = DMI – export). The definition and methodological presentation of the DMI and DMC are taken from the methodological guidelines of the Wuppertal Institute applied by EUROSTAT and the European Environment Agency. Owing to more accurate sources of information, the values for previous years have been corrected. The total quantity of used materials does not include unused resources (the so-called hidden flows), such as biomass waste in agriculture and logging, tailings from coalmining, etc. To sever the links between economic growth and pressures on the environment. Analysis of waste and material flow. Material and waste flows monitoring is one of the tools for monitoring the development of the use of natural resources. Direct material input is an indicator showing the total weight of materials used by a certain economy (or country) for its operation over a certain period of time, including the materials acquired from nature on the country’s territory (fossil fuels and other mineral materials and biomass) or imported materials. The difference between direct material input and the quantity of exported materials in the same period is the indicator Domestic material consumption. In 2007, Slovenia produced and imported a total of over 61 million tonnes of various materials. Almost half of these materials (46%) are mineral materials obtained in Slovenia, mostly technical stone, gravel and sand which are used for the construction of buildings. The quantity of raw materials for construction obtained in Slovenia increased by one half in the period from 1992 to 2007 and contributed a major part to the increase in material use per capita (DMC per capita). The latter increased from 16.6 tonnes in 1992 to 30.3 tonnes in 2007. A substantial increase was also perceived in the total weight of imported goods, which represent almost one third of all materials used in a year. The share of the domestically obtained renewable materials in the form of biomass, i.e. agricultural products, catch and wood biomass, represents only one eighth of all materials. In 2007, Slovenia exported more than 12 million tonnes of different materials. The indicator domestic material consumption in Slovenia shows 49.3 million tonnes, i.e. 24.4 tonnes of materials per capita. This is 87% more than domestic material consumption per capita in 1992 (13.0 tonnes per capita or 25.9 million tonnes in Slovenia). Due to a still rather indeterminate methodology of DMI representation, the data for comparison with the EU are only conditionally appropriate. 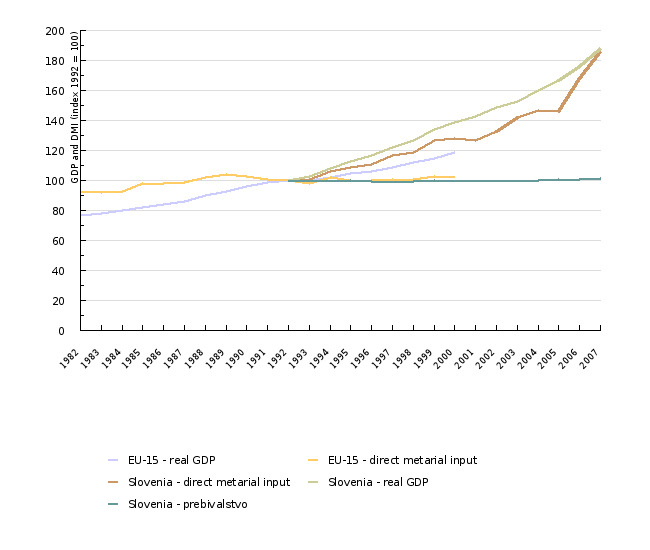 However, they indisputably attest to the fact that in the 1990s the DMI per capita was rather stable in the EU-15 (approximately 19 tonnes and, according to another source, approximately 17 tonnes per capita), while the total quantity of materials imported into Slovenia was increasing rather rapidly. This is related to the economic development in Slovenia, a fact which can be deduced from the comparison with the real GDP trend which is increasing slightly faster than DMI. Similar development was taking place in the 1980s in the EU-15 countries. A relative separation of trends of DMI and GDP can be perceived, i.e. the so called "decoupling" phenomenon which represents one of the priorities of the European Union Strategy for Sustainable Development. This is mainly a result of the increase in the share of service activities in GDP. The 2005 data showed some reduction in the growth rate of direct material input and domestic material consumption; despite the growth of GDP, the direct material input remained on the same level as in 2004. In addition to the bountiful harvest and consequently improved DMI from agriculture, higher input of biomass from forestry and a slight increase in mineral extraction, the reduction in the growth rate of DMI was a result of a decrease in the production of fossil fuels, and particularly the decrease of direct input of materials from export. 2006 and 2007 saw a substantial increase in material consumption, particularly owing to the increased import (15% in 2006 and 23% in 2007) and production, i.e. extraction of natural mineral resources necessary for construction – in 2007 they were 36% higher than in 2005. The methodology of presenting the indirect material input for Slovenia was adopted from Dr. Stefan Bringezu. The source of the data on agricultural production is the SI-STAT database from the Statistical Office of the Republic of Slovenia, the data were obtained on 17th September 2008; the calculations were made based on the coefficients provided by the Wuppertal Institute. In the previous publications of this indicator (Environmental indicators 2003), the source of data was the FAOSTAT database, but it was not entirely accurate, which is why the values for the previous years have been corrected as well. 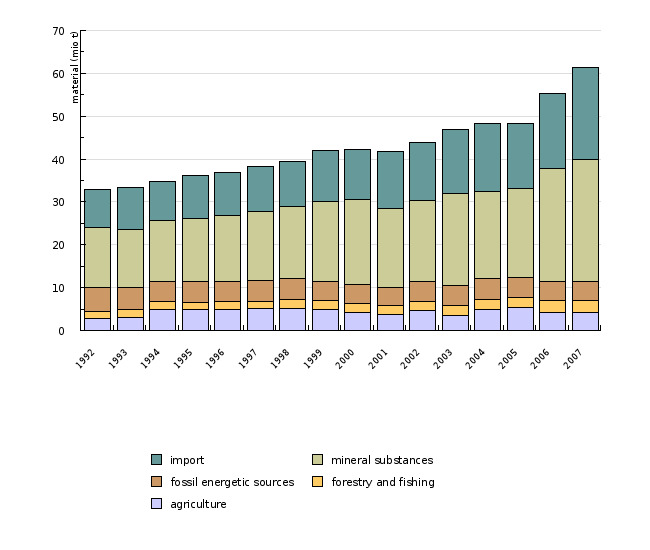 The data on the extraction of fossil fuels are taken from the Statistical Yearbook of the energy economy of the RS for the years 1992 – 2003 and from the Survey of mineral raw material production in Slovenia that was published in the bulletin Mineralne surovine v letu 2007 [Mineral raw materials in 2007] (Ministry of the Economy and Geological Survey of Slovenia). The data on the extraction of mineral non-metallic raw materials are published in the bulletin Mineralne surovine v letu 2007 [Mineral raw materials in 2007]. Data are available for 1983, 1988, 1993, 1998-2007, while the quantities for other years were estimated using linear interpolation. The data on imports and exports are taken from the data on foreign trade, collected by the Statistical Office of the Republic of Slovenia: Statistical Databank (1992-1994 and 1998-1999), directly from the InterISPO (1996, 1997) application, and the SI-STAT database for 2000-2007 (accessed on 17th September 2008). The data for 1995 is an estimate obtained by linear interpolation. The data on population and GDP are taken from the SI-STAT database of the Statistical Office of the Republic of Slovenia on 18th September 2008. The data refer to the trends of the real GDP (1992 = 100). EU-15 are member states of the EU prior to 1st May 2004. The collective data for these countries are also shown for the period prior to their accession to the EU.